The Shepherdstown Community Club (War Memorial Building), 102 E. German St., Shepherdstown, WV, hosts a four day exhibition of new works by artists Susan Carney, Isabelle Truchon and Neil Super. The exhibit runs Thursday, July 26th through Sunday, July 29th, during the final weekend of the Contemporary American Theater Festival. Exhibit hours are 10am-8pm Thursday and Friday, 9am-9pm Saturday, and 9am-5pm Sunday. There will be an ARTISTS’ RECEPTION on Saturday, July 28, from 5pm-9pm with live music and refreshments. Susan Carney utilizes a unique printmaking process to create series of monotypes, a one of a kind print. Much of Carney’s recent work reflects her intrigue with sources of personal identity, such as genetics, cultural heritage, or just plain fate. One of her monotypes was recently chosen to be the publicity image for the Western Maryland Blues Fest in Hagerstown, where she will exhibit a one person show at the Washington County Arts Council during the month of June. Carney recently relocated from Shepherdstown to St. Mary’s County in Maryland, where she opened her own studio, Studio 5 South, on Point Lookout Road. Carney, who has exhibited her work widely in the Mid-Atlantic area, received her M.F.A. from The University of the Arts in Philadelphia. Her work is displayed locally at The Ice House in Berkeley Springs WV. Isabelle Truchon is a multi-media artist producing paintings, reliefs and sculptures inspired by nature, animals, relationships, and life’s journey. 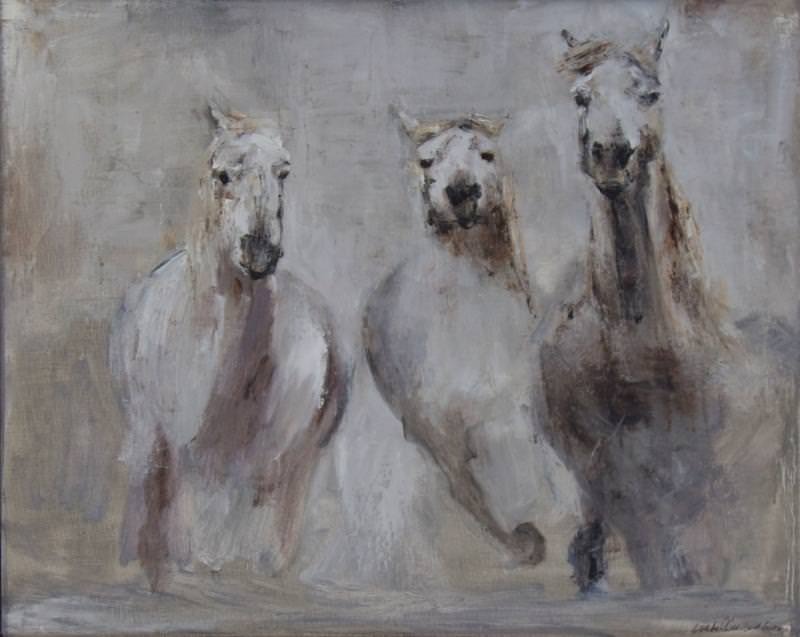 Drawing particular inspiration from components found in nature and cave art, Truchon’s current work is inspired by her photographs and experiences of the wild horses of Camargue, France, where she spent time in 2017 observing and forming emotional connections with these animals in their natural habitat. Truchon received her Bachelor of Fine Arts in Painting from Shepherd University. She has exhibited extensively in Northern California, Virginia, DC, and Jefferson County WV, and her work is found in numerous institutional and private collections. Truchon lives and works in Harpers Ferry. Neil Super is a self-taught wood turner who often uses the wood from downed trees at local and regional historic landmarks to create pieces that provide the viewer with both a historical context and a personal connection to the provenance of everyday, useful objects. He strives for functionality while also embracing the unique character of so-called “defects” in a piece of wood that so often reveal otherwise hidden beauty. Super, whose work may be found at the Bridge Gallery and numerous fine art and craft galleries in West Virginia and Maryland, lives and works in Shepherdstown.